An early start from Rarangi this morning guaranteed our arrival into Picton in time to check in for our sailing through the Marlborough Sounds out into the Cook Strait and eventually into Wellington City Harbour. It was a bright sunny day with calm waters in the sounds - perfect for a ferry crossing. The journey between Picton and Wellington takes 3 hours in the passenger and vehicle ferry and there is plenty to see while travelling through the sunny Queen Charlotte Sound - sailing boats, speed boats, and pretty bays. Passing through the entrance to the Tory Channel with jagged rocks on each side we are suddenly spilled out into the Cook Strait. From here on in the sailing became a little lumpy and the gale force winds kept us indoors on the ferry. The wind continued on into the Wellington harbour giving meaning to why Wellington is sometimes nicknamed "windy Wellington". Once we were unloaded from the ferry we set off in search of an open carpark (necessary because of the camper) and found one right at the waterfront where we planned to spend the majority of our time. We walked for what seemed like forever, but there was so much to see along Wellington's historic and interesting waterfront. 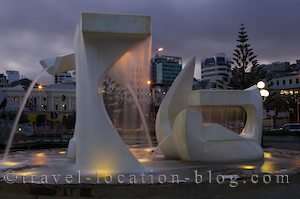 Much modernised, the waterfront is a real centre for gatherings from its many restaurants and bars of Queens Wharf to the "City to Sea" Bridge which connects the waterfront to the Civic Centre which is fringed by a grassy belt. A trip to Wellington just isn't complete without a ride on the Wellington Cable Car to the Wellington Botanic Gardens, so we took the ride and were rewarded with stunning views of Wellington from above. Returning to Lambton Quay where we began our cable car journey we set off again for the Parliament Buildings - old and new including the 1980's Beehive which is the present day offices of parliament officials. Later at night we decided to find a place to dine at for dinner which we thought would be simple enough since Wellington seemed to be a "hip" kind of a place with a healthy nightlife. But alas, we could not find a restaurant besides McDonalds, Burger King, and a few other takeaway establishments in downtown. We ended up settling for a food hall situated in a cinema complex. It was Friday night and the place was basically shut down by 7pm! Oh well, we returned to the Civic Centre for a few sunset shots then headed north out of town and found a camping spot (after much searching) along the waterfront between the towns Raumati South and Paraparaumu. It was right on the coast with a view towards Kapiti Island along the Kapiti Coast (north of Wellington).